The smallest of the three Maritime Provinces, Prince Edward Island (PEI) is the only province completely separated from the mainland. The small island has 1,100 km of coastline. There are approximately 90 beaches on the island. All of these beaches are accessible to the public. The southern shore of the province faces the Northumberland Strait, while its northern shore dips into the Gulf of St. Lawrence. The province’s lush landscapes make for a well-developed tourist industry, which includes eco-tourism, adventure tourism, and its many beaches. PEI’s coast is full of long beaches, sand dunes, cliffs, saltwater marshes, and of course urban harbours. Beaches along the northern coast feature white sand, while those on the southern coast have iconic red sand beaches. The red sand comes from the sandstone cliffs along the shore. A great example is Prince Edward Island National Park which features over 40km of coastline containing both cliffs and beaches. Inland saltwater marshes provide important habitat for migrating birds, including the Great Blue Heron and the Piping Plover. PEI’s beaches even sing. The Singing Sands Beach at Basin Head Provincial Park has white sand which sounds like singing (or more accurately, squeaking). Charlottetown is the capital and largest city, while Cornwall and Stratford are its suburban extensions. Tea Hill Beach and Argyle Shore Provincial Park are a short drive away and provide great getaways for a day at the beach. The island’s moderate climate, which is influenced by the surrounding waters, means that summers are typically warm. Temperatures can reach up to 30°C. Like in neighbouring New Brunswick, water sports are popular on the island because of its warm waters along the Gulf of St. Lawrence and the Northumberland Strait (water temperatures reach up to 25°C in August, with averages of around 18°C). 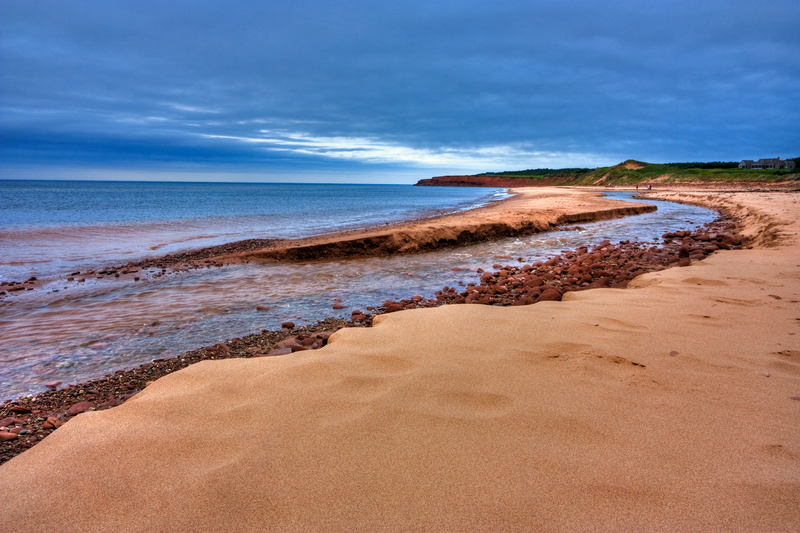 The majority of PEI’s beaches are sandy and located in provincial or national parks. Because PEI can be crossed in 2-3 hours, day trips to the beach are easy. No matter where on the island you end up, the rugged, natural beauty of its beaches are a special attraction.